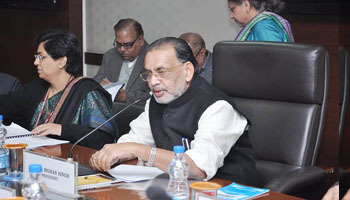 Speaking on the occasion of the 75th General Council Meeting of NCDC Union Agriculture Minister Radha Mohan Singh said the NCDC has a record of promoting development of cooperatives for over five decades and it has done a wonderful job so far. The meeting was attended by several key officials including NCUI President Chandra Pal Singh and MD Vasudha Mishra. “I would like to congratulate NCDC and its team of dedicated officers for their continued excellent performance. In the current year 2015-16, while financial sanctions of the order of Rs.5698 crore have been made upto 31.01.2016, the disbursements stood at Rs.5630 crore, exceeding the target of Rs.5600 crore for the year. Net NPA of the Corporation is maintained at ‘Zero’ and recovery rate over 99.2%. I am sure that NCDC will continue to achieve ever greater heights and higher standards of performance in the years to come”, the Minister said. He laid emphasis on greater investment in infrastructure, marketing, storage and transportation has to be made. It is here that agricultural cooperatives have a very important role to play. The country here is in an advantageous position as it enjoys the distinction of having about 6 lakh cooperatives with a large member base and covering around 98% of the villages, he underlined. The Programme of Activities of NCDC for the year 2016-17 involves a financial outlay of Rs.6000 crore for promotion of various cooperative development programmes during 2016-17. During the year 2016-17, NCDC would continue to support and supplement Government efforts towards development of cooperatives in agriculture and allied sectors. The focus would be on consolidation of the existing infrastructure and units established by the cooperatives especially for value addition and processing of farmers’ produce, strengthening of forward and backward linkages for procurement and marketing, upgradation and modernization of the cooperative units.